The above picture is not a super ripe banana. (Though I have a couple of those on my counter begging to be baked into a banana bread.) 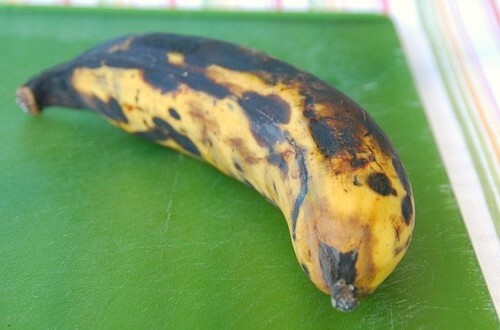 It's actually a perfectly ripe plantain. Though used primarily as a vegetable, a plantain, like a banana, is a fruit that can be used in both savory and sweet dishes depending on its level of ripeness. When still green, a plantain is hard and starchy, like a potato. As it ripens, the peel turns nearly black, while the flesh becomes yellow and sweet. Fully ripe plantains are soft and creamy in texture, emit a mild banana fragrance, and are supremely sweet. Plantains take several days to ripen, so if you want to cook some soon then buy ones that are already blackened in the supermarket. How is a plantain different from a banana? 1. Plantains are much firmer and heavier than bananas. 2. Plantains have a lower sugar content than bananas, making them less sweet. 3. Plantains should be cooked, whereas bananas can be eaten raw. Note: My friend Aparna who lives in India, noted that certain sweet plantains can be eaten raw. Thanks, Aparna! 4. Plantains can be cooked when still green and not fully ripe, for a starchier consistency and less sweet flavor, or when blackened and fully ripe, for a softer consistency and sweeter flavor. Bananas, however, cannot be eaten when green or unripe, unless you want to experience a distinctly unpleasant chalky aftertaste. Plantains are a staple in many South American, African, and Asian countries; fortunately, they're gaining status in the US as well. That's a good thing since they're so versatile: they can be boiled, baked, sauteed, and fried and work in dishes ranging from appetizers to desserts. In the States, many plantain recipes are Cuban or Mexican in origin and feature ingredients such as chiles, honey, lime, and brown sugar. Plantains make an easy and delicious side dish especially with Baja style fish tacos. 1. Cut off the top of the plantain. 2. Using a sharp knife, gently cut lengthwise along the plantain, being careful not to cut into the fruit (as shown above). 3. Using your hands, open the skin, remove from the plantain and discard. 4. Slice plantain into equal sized pieces (as shown below). 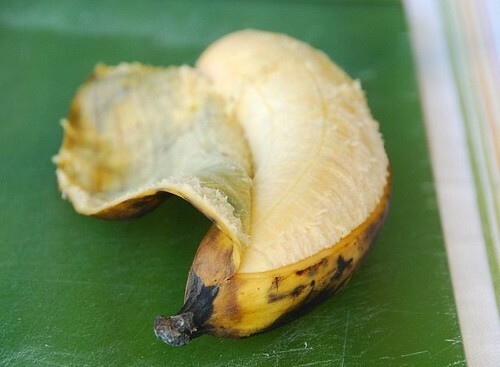 You'll notice when you slice a plantain, that the fruit is a pinkish-yellow. As it cooks, however, it will magically turn a deep, rich gold color, while the flesh becomes creamy. I usually saute plantain slices in a little olive oil or butter until lightly caramelized and douse them with some Tabasco sauce and lime juice. Today, however, I opted for a slightly sweeter take. Caramelized plantain slices are drizzled with warm, rich honey, and sprinkled with cayenne pepper and lime juice, for a singular sweet and tangy flavor. Pour olive oil in a large non-stick skillet until evenly coated and place over medium-high heat. 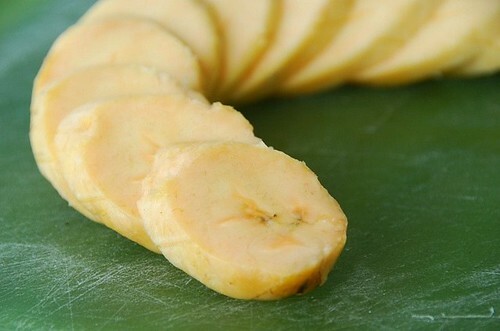 Add plantain slices in a single layer (do two batches, if necessary). Cook plantains for 1 minute, flip over, and cook 30-60 seconds, or until browned. Keep your eye on the plantains as they'll brown very quickly. Remove from the pan, and place on a paper-towel lined plate. Cover with foil until all plantains are cooked. Place plantains on a serving platter. Drizzle with quality honey, then sprinkle with lime juice, salt and cayenne pepper, to taste. Serve immediately. I'm sending my plantains to Amy and Jonny of We Are Never Full, this week's hosts of Weekend Herb Blogging, created by Kalyn of Kalyn's Kitchen. I love plantains, especially the way Brazilians cook them. This is a nice simple recipe Susan! These look so good. Growing up, we had a few Cuban neighbors and they always made these. Wow. I love plantains. This is a little twist on the usual. I'm going to try it. Thanks. I love making tostones -- in fact, I bought a little tostone press at the Latino market in South Providence, just for the fun of smooshing the tostones with it! I just love plantains, though I usually make them the way my old Cuban roommate taught me. I really like what you did with them. I love plantains. They are so versatile and interesting! Your dish looks really good! You've done them just the way I love them! Very gorgeous. I love lemon but somehow lime with these is so perfect. How interesting Susan! Here we have bananas and plátanos and also male bananas (used for cooking only). I wonder how translations would go here: would a plantain be a plátano? We eat plátanos and are better than bananas. I've seen plantains so often but never wandered near them...now all you've written about them is enticing me to try it, especially the tabasco & lime version. Mouth's watering Susan! Great post! I've only had plantains once (in Miami) but they were delicious. 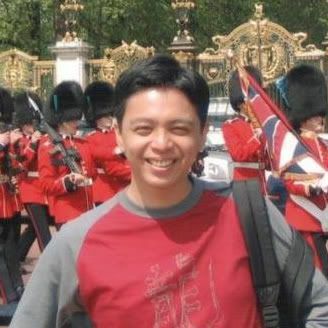 I love your blog, it was the first blog I ever found on the internet and read religiously. However, there is just one food I can not eat or stand the smell of: BANANAS. I am sure the plantain has the same odor? Don't be mad at me. It's the ONLY thing I won't touch! I will eat anything else you make!!!! I was just going to say what Mishmash said. :) Our traditional cooking uses both bananas and plantains in so many different preparations. Just wanted to mention something, Susan. Ripe plantains can be eaten without cooking. Some of the varieties we get here are very sweet. Green/ raw bananas cannot be eaten but they can be cooked. We also have a variety of banana which is green when raw and ripe which is very sweet. The recipe sounds delicious. Very informative post! I've tasted plaintains before, but I've never been adventurous enough to cook with them. This sounds so good, though! 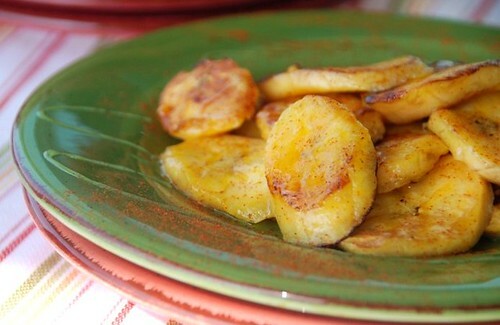 The carmelized plantains with honey and lime sound like a nice balance of sweet, sour and spice. I am still trying to love plantains, and this recipe might do the trick. Thanks for the informative post on plantains. I love learning new information about foods. Wow, it seems that I am the only one who never heard of plantains before and I realize every day how little I know about food. Thanks Susan, for the lovely post. We have quite the Caribbean community and they are responsible for my introduction to them...delish! shn-I have never made ghee, but I should. lydia-You bought a tostone press? That is so cool! mark-Who doesn't like them fried? tanna-Lime strikes just the right acidic touch. deeba-Try them next time! They're great. kalyn-I had them there too... at a Cuban restaurant, of course. karen-I'm glad you like it. deborah-They're so easy. Hope you try them! lynda-Let me know if it does! hilary-I'm so glad you found it helpful. ivy-There's so much to learn every day for all of us! Ooh, thanks for this informative post. Now I need to go find a plantain to try. Susan, I love plantain! In Malaysia, we have something that looks similar that we call pisang (banana) tanduk (horn) because of the shape. Here, I usually just deep fry (battered) or make banana fritters or last but not least, coat them with egg, deep-fry and then chilled them in sugar syrup overnight. Heaven! lol. Totally fabulous. I am addicted to Plantains! 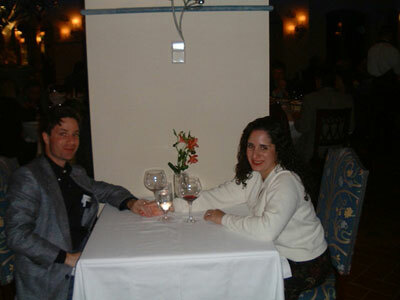 If you are up in Costa Mesa sometime try Habana's Restaurant, excellent plantains and Cuban food. 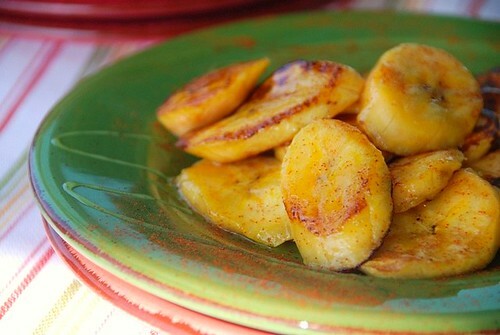 Wow, lime and seasoning with ripe plantains...this I need to try! I make a batter coated deep fried snack using ripe plantains,, Check this http://tangerineskitchen.blogspot.com/2008/09/ethakaappamplantain-fritters.html. oh I have not had a plantain for ages. we used to have them a lot when i'd visit my grandparents in india! it's hard to find them here. i still love the idea of caramelizing them! I hate to admit it, but I've never had plantains before. This recipe looks wonderful and I really enjoyed having all the information about them (thanks!). I'll try them as you suggested; on the side of a fish taco meal. Sounds like a great dessert. I love Carribean flavors, so I definitely love seeing new and different plantain preparations. The only thing I ever learned from Ingrid Hoffman is that putting the plantain in the freezer before peeling them makes them much easier to peel. Ooh, the lime and cayenne are really calling me! Looks good - I love a great plaintain! Love it! looks so delicious...... just like to put my finger into it! Another yummy food to try...never had plaintain. Sweetie had about 37 different kinds of bannanas and their relatives when he lived in the islands of the Pacific, but I only know the grocery store bannana, so far. With this recipe that will surely change. I love the glossy, golden finish on those plantains. And the addition of honey would be lovely. Glad to find that recipe. Now I can try to cook a plantain. I've had some at work that my coworkers have brought in but never tried to cook one myself. I am a huge fan of plantains! And this is a simple recipe I can get into. Yummmm! Interesting facts about plaintains. I don't think we do much with Plaintains here in Oz, because until I started blogging, I'd never heard of them. They sure look good once cooked. Ooh I love plantains but have never made anything with them at home. This looks great! snt-Oh, my, banana fritters sound heavenly! I've got to try that. Thanks! arfi-I'd love to see them growing on the trees. Isn't it interesting how each of us has such a different perspective? rachel-Yum! I will check it out. Thanks. meeta-I've never had them in an Indian restaurant, though I'd like to. gffg-Oh, you've got to try one! sdoc-Huh. I haven't tried that.Thanks though! sukhada-You're welcome! Thanks for visiting. lori lynn-They called me too! elle-I only have the grocery store kind too, but they're good. tw-I enjoyed taking the pics too. debbie-They're easy, so I'm glad to help! heather-That must have been lovely. ashley-I hope you try them. They're really easy to make. Yay, I knew that! Carribean cooking makes a lot of use of plantain in its cuisine. It's just a shame they're not as freely available here in the UK. Thanks for the thumbs up on my risotto!